Heading to Addis Ababa? 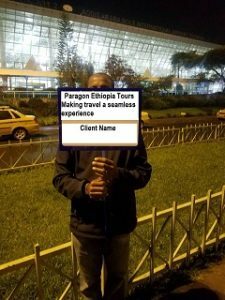 Book a vehicle with Paragon Ethiopia Tours before you leave so you can avoid the hassle of having to look for transport when you arrive! We have a wide choice of cars along with our easy and convenient booking process online or over the phone. The best way to get from Addis Ababa Bole International Airport to your destination is very simple. Just contact us and book your to and from Addis Ababa airport transfers to save time and to get the best deals on car hire and accommodation. We will take care of all your airport transfer worries. Our Addis Ababa airport ground transportation options include private transfers, minibuses or coaches, and shared shuttles. Your transfer time is estimated and may vary, primarily depending on number of stops made and traffic. We cover all types of vehicles including sedans, limousines and medium buses. You can find the deal that best suits you with us. All our drivers can speak very good English if not excellent. Why book your Addis Ababa Airport transfers with us? Wide range of transfer options with safe, licensed & quality vehicles. Addis Ababa Bole International Airport is Ethiopia's oldest airport. It was built and opened for business in 1960. It sees 8.5 million passengers a year and is notable for its passenger friendly design, excellent service and high quality facilities. Its facilities as expected include excellent wi-fi throughout the two terminals. Travelers rate it highly for ease of check-in and punctuality of arrival and departure. Addis Ababa Airport is well served by transfer options to Addis Ababa and other African cities. This airport is located in the Bole Area southeast of Addis Ababa. Addis Ababa Bole International Airport has two terminals, and these terminals are Terminal 1 which serves domestic flights whereas Terminal 2 international flights. Ethiopian Airlines has bagged the top African airline for three years running. Airport Facilities: 11 gates. Terminal 1 has 4 gates and Terminal 2 has 7 gates. Price: $25 per person with a minimum of 2 peoples. Price Includes: private vehicle, gratuities, and government tax. Addis Ababa Bole International Arrival Statistics: It's easy to check the current status of flights arriving into Addis Ababa Bole International Airport. Airport Security: Addis Ababa Bole International Airport requires baggage checks and metal screening of passengers. New and innovative security systems have been adopted to ensure the viability of the airport operations. Filming: Addis Ababa Bole International Airport welcomes filming on site not subject to a fee. Filming can take place in the public areas in the airport landside, but restricted in the airside. Filming is also prohibited in the baggage reclaim, security, immigration and customs areas. Aba Tenna Dejazmach Yilma International Airport (DIR) in Dire Dawa. Lalibela Airport (LLI) in Lalibela. Gondar Airport (GDQ) in Gondar. Likewise, if you book Ethiopia tours where transfers are not included, you need not be worried about where to go when you arrive. We are pleased to help you get your tour destination safely. We can also organize memorable Addis Ababa city tours or day trips from Addis Ababa for you which you can do them when you have free time while you are in the city. The following information are important to book your Addis Ababa airport transfers. Drop-off point including hotel name. Access to the airport: Addis Ababa Bole International Airport can be accessed through controlled-access highway from which vehicles can enter either the departure place or the arrival place. The Airline Lounges: Addis Ababa Bole International Airport's lounges offer reduced cost food, all types of beverages, showers, and internet services. Passengers can enjoy a wide range of food and beverages lounge in one of the many designed rest areas. Services and Amenities: Some of the most important Addis Ababa Bole International Airport's services and amenities include duty free shops, restrooms, passenger waiting areas, Wi-Fi service and access, and secure area for stranded passengers to rest and sleep. Smoking at Addis Ababa Airport: Smoking is permitted anywhere outside the terminals, and one can use the smoking booths at the designated areas in the airport. The Cloud Nine Lounge at Terminal 2 has a smoking room, and one has to pay to access it. Addis Ababa Airport Parking: The airport parking area is located just a few meters away from the airport. Our company representative will be waiting for you within a short walk from the exit of the airport carrying a meet and greet board with your name on it. Once you exit the aircraft follow the signs to the baggage claim. Continue following all signs to the baggage claim area. Once you have collected your luggage from the proper baggage claim area, proceed to the lower level following the signs to airport exit/ground transportation. Your taxi/minivan is conveniently located at the parking lots very close to the right exit of the airport where you will meet your driver at. Internal Transport: Buses serve departing passengers travelling towards the terminal and arriving passengers travelling towards the gates. The Addis Ababa Bole International Airport buses are equipped with larger luggage space. Make sure all your documents are with you. You will be dropped off at the airport entrance gate. Check the screen for departing flights. Here you will find information about check-in desks. Go to the departure halls on the first floor for all departing flights. Go to the right desk to check if your luggage is according to standard regulations. Then follow the signs to your gate. Pass through passport-control and security check at the gate. Then you will arrive at Addis Ababa Airport Lounge. In the lounge shops, food and beverage amenities and places to relax. Keep in mind the walking distance to your gate. You can wait at the gate until boarding time. Bookings maybe cancelled in writing by email or by phone the office phone +251911524616 in relations to the cancellations hours. Any booking there been cancelled before 12 hours of journey time will not incur any cancellation fee. Bookings there been cancelled between 12 hours and 6 hours of travel/meeting time will incur 50% of quoted price. Cancellations informed in less than 6 hours of actually arrival time will incur 100% of quoted price. Any booking made within 6 hours period of meeting time will incur a cancellation fee of 100% of the quoted price. Please use the below airport transfer form to book your Addis Ababa Airport ground transportation.